Chinese take-out is a fast and easy meal option when life gets too busy and hectic for us to cook at home. 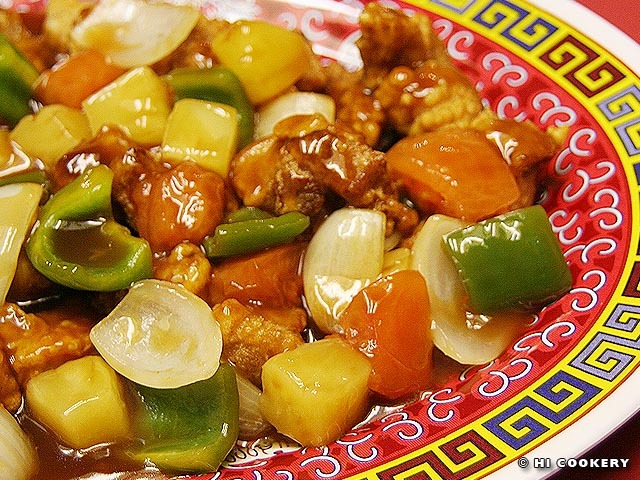 Sometimes, we are disappointed in the sweet and sour pork we usually order because 1) there seems to be more coating covering less meat, 2) the sauce is a super-saturated and unnaturally fluorescent red color and 3) the vegetables tend to have lost their crispness and fresh flavors. Homemade sweet and sour pork is tastier yet a tad time-consuming. But it is worth the effort when “going gourmet instead of take-away.” Try cooking this classic Chinese recipe when time allows and when observing National Pork Month. Cut the pork into 1-inch cubes. Make the marinade by combining in a large bowl the sugar, sesame oil, salt, sherry, oyster sauce, soy sauce, egg and pepper. Soak the pork for at least an hour. Reserve the marinade to mix with the batter. 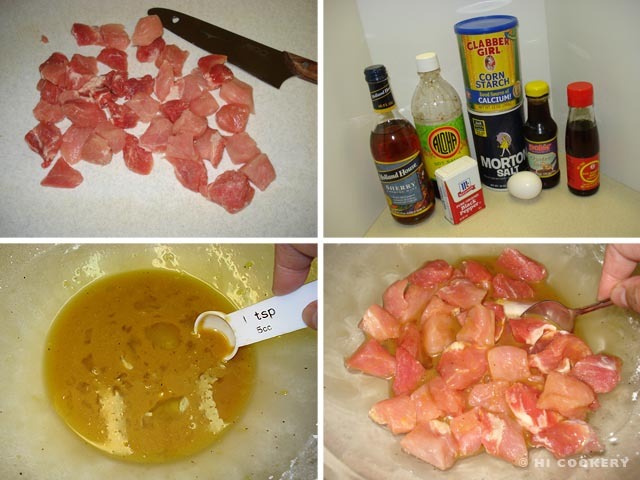 Remove the pork from the marinade. In the marinade bowl, add the egg, cornstarch and water. Mix well and return the pork to the marinade. 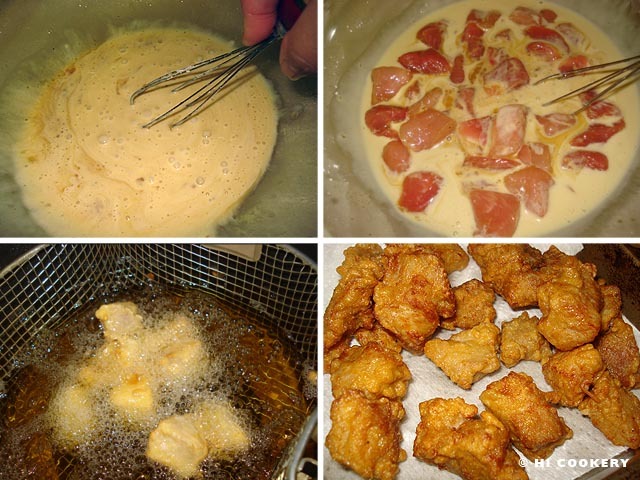 Deep fry in hot oil until the pork pieces are cooked through and the batter becomes golden brown. Drain on paper towels and keep warm. Prepare the vegetables. Set aside with the drained pineapple chunks. Bring to a boil over the stove top the sugar, vinegar, soy sauce, sherry and ketchup. Reduce the heat to simmer. In a cup, mix the cornstarch with the water or pineapple juice to make a smooth paste. Stir into the sauce until thickened. Remove from heat. In a separate skillet, heat the oil. Saute the garlic, then gently mix in the bell peppers onions, tomatoes and pineapple for 3-4 minutes. Do not overcook to retain the freshness of the vegetables. Discard the garlic. 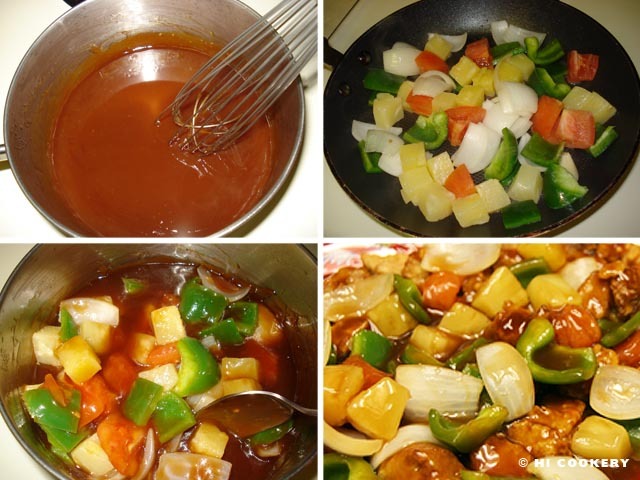 Add the vegetable and pineapples to the sauce until everything is well coated. Arrange the fried pork pieces on a platter. Pour the sauce mixture over them. Serve hot with steamed white rice or noodles. Thanks to Sister Durie K. for giving us her “antique” cookbooks, “Taste of Hawaii” (1985), compiled by Mary Cooke, former food editor at The Honolulu Advertiser, and “Chinese Cooking” (1973), published by Drake Publishers Inc.
Plan ahead for each step in this recipe. Marinate the pork early in the cooking process. 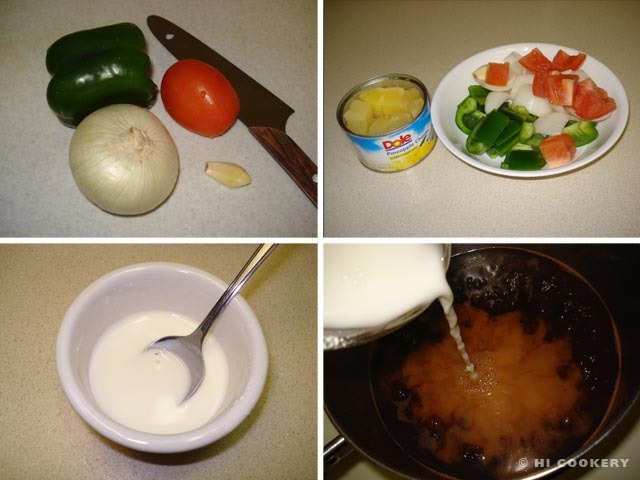 The sauce can be made beforehand and reheated before adding the fresh vegetables and pineapples to save time. Islander’s maternal grandmother used to raise pigs in her homestead. Sometimes she would sell the whole hog at the marketplace or keep some of the swine to feed her family. Islander’s Mommy, the second of five children, learned how to prepare a simple pork dish, adobong baboy, a type of Filipino stew, from her mother and eventually passed on the easy recipe to her own daughter. 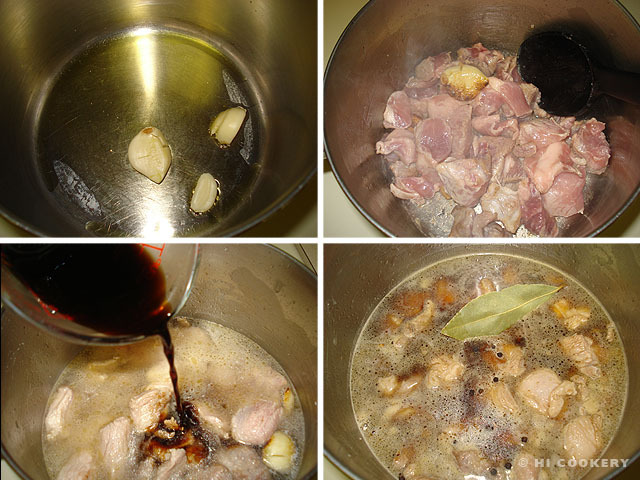 Islander prefers the saucy-style over the dried-then-fried version so our blog recipe post features more liquid in our pork adobo. Cook it to commemorate National Pork Month or to feed Filipino friends and family! Cut the pork into bite-sized pieces. In a large saucepan, heat the oil and saute the garlic for a few minutes, being careful not to burn the cloves or the dish will become bitter. Add the pork pieces and cook until brown. Pour in the water, vinegar and soy sauce. Bring to a boil, then lower the heat to simmer. Add the peppercorns and bay leaf. Cover the saucepan and cook for 30 minutes or until the pork is tender. Discard the garlic, peppercorns and bay leaf. Serve the pork adobo with hot, steamed white rice. 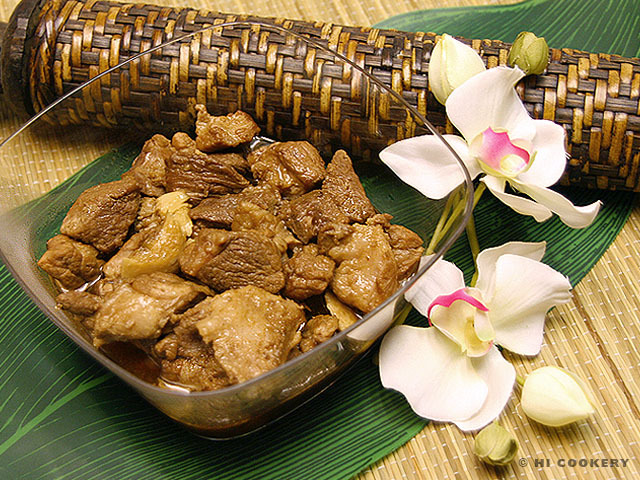 Some of our Filipino friends have different versions of pork adobo. Islander’s aunts would just add all the ingredients in the sauce pan, then transfer the cooked pork pieces to a skillet and fry them for a little crispness. Another friend, Girlie B., substitutes a can of coconut milk for the water for a more fragrant stew. And our kumare Cherlyn B. combines chicken with the pork in her adobo. Beware that the vinegar aroma does permeate throughout the house while cooking this dish!